September 7, 2016 – Hyères, France – An Easterly breeze blowing around 18 knots, much stronger than forecasted, has characterized the third day of racing here in Hyères. 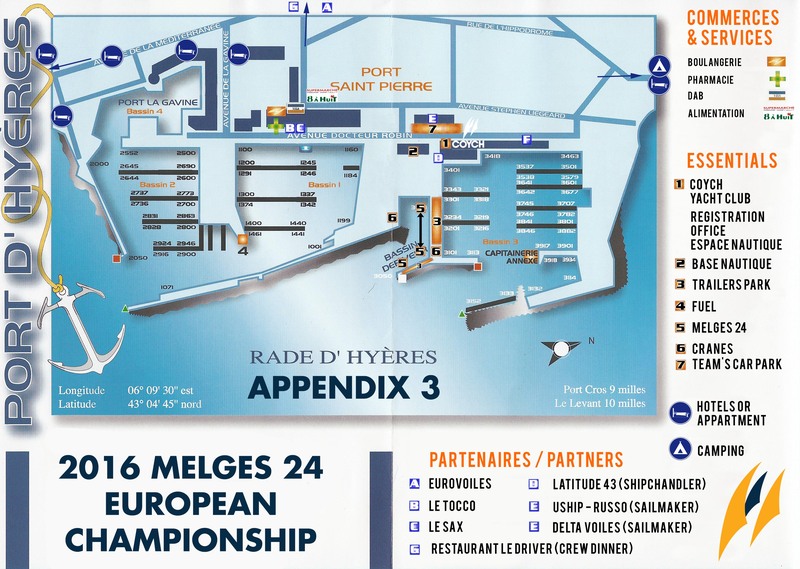 The crews have been facing challenging conditions in terms of wind and waves, in the day that represented the turning mark of this Marinepool Melges 24 European Championship 2016 hosted by COYCH in cooperation with the International Melges 24 Class Association (IM24CA) and French Melges 24 Class Association. 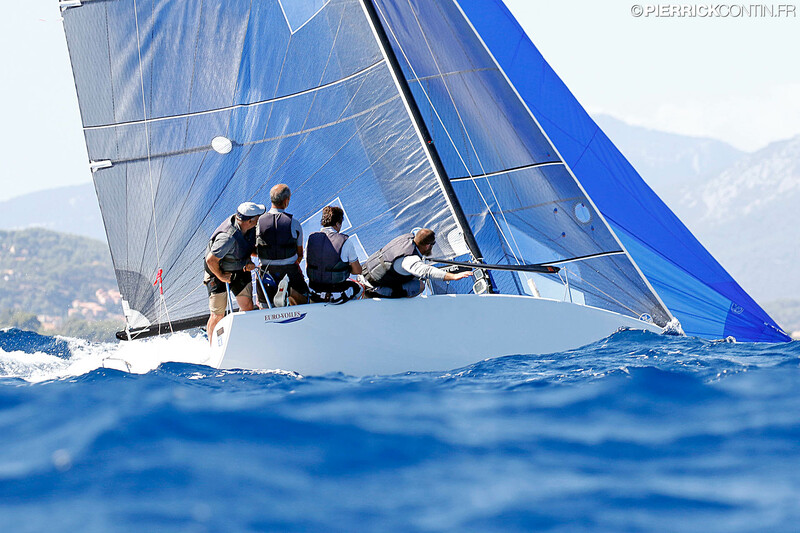 Benedek Fluck, IM24CA Championship Coordinator for the European Melges 24 events, made some reflections on the Championship that has now less than half way to go. “The Championship is going great, we have had very good weather conditions that allowed the fleet to finish each race in sixty to seventy minutes,” he said, and then added: “The ranking is challenging and I think that until the last day there will be a great fight for the podium”. Today’s challenging conditions were great fun for all the crews and proved that Melges 24 is a safe and fun boat for everybody, not only for professional sailors, as demonstrated by the wide number of crews competing in the Corinthian fleet. “Melges 24 can be considered a sort of family boat that is fun to sail in many different conditions and Melges is the best class in the world”, declared Michael Tarabochia from Germany who sails on White Room along with his two sons Luis and Marco, respectively helmsman and bowman, and that is currently fifth in the Corinthian ranking. It was a good day also for the French crew Euro-Voiles helmed by Christophe Barrue, that for the first time in this Championship raised the French flag over the fleet, gaining a first place in race number 8 with a good margin over the opponents. “Winning in your home country is always reason of great happiness. Today we had a good start but what really helped was the downwind leg, where we were very fast with the gennaker. Moreover, the choice of the tactician to stay on the right side of the course, paid well”. In the overall ranking, after today’s races, there is a new leader, the reigning World Champion EFG by Christopher Rast. The team expressed its satisfactions through the words of the only woman on board, Danielle Rast, who wanted to underline how much she would like to have more women in the sailing world and, in particular, in Melges 24 class. “There should be more girls in the sailing world and the Melges 24 is a great boat to be on, being the crew made by five people, it is perfect to do a mixed team of men and women. It’s not only a guys’ world and I would love to be in a female crew”. Mother since a few months, she also added: “EFG team will fight hard in the next three races, my son Connor won’t let us go home unless he gets on the podium!”. The overall ranking sees today EFG SUI684 in first place with 31 points, followed in the top five by Gill Race Team GBR694 (35), Marrakech Express ITA636 (44), Bombarda ITA841 (50) and Lenny EST790 (51). In the Corinthian division, Lenny doesn’t manage to overcome the five points gap that divides the team from Gill Race Team, that firmly maintains the first position with 19 points. Taki 4 ITA778 (31), Storm Capital Sail Racing NOR751 (31) and White Room GER677 (56) occupy the third, fourth and fifth positions, respectively. After three days of champagne sailing, tonight is time for real champagne for the crews involved in the Championship: all the teams are going to meet at “Driver”, to celebrate with a party that will for sure reflect Melges Class’ friendly environment. Tomorrow, skippers’ briefing is scheduled for 11.30 am, while the preparatory signal is intended for 1 pm. A wind shift to West is forecasted and the intensity of the breeze should be lighter than today, blowing around 10 knots.